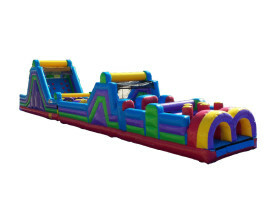 The 70' inflatable obstacle course is perfect for parties and events taking place at public parks or in large backyards. Competitors will duck, dash, dodge, climb, crawl, and slide to fight their way to the course's finish line. Do you think your guests have what it takes?